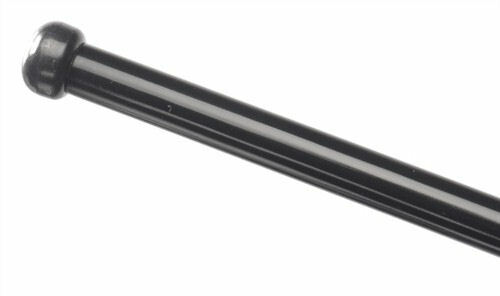 The ASP Friction Loc Black Chrome Baton is made from 4140 high carbon steel. 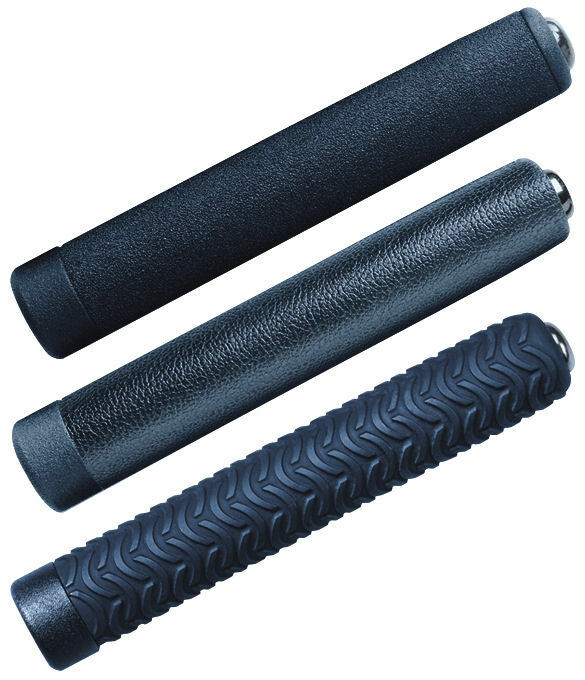 The handle part of the baton is coated with zinc and covered with your choice of 3 grip styles. The final finish is of true Black Chrome plating which makes this baton highly corrosion resistant. ASP uses 4140 Steel tubing in most of their batons. This type of of tubing is not available in the U.S. As a result, ASP has the steel produced in Germany. A special chemistry of steel is poured and then pierced into rounds. It is then transported to America where the raw stock is then drawn into tubing according to strict ASP specifications. This makes ASP the only source of 4140 tubing for Tactical Batons. 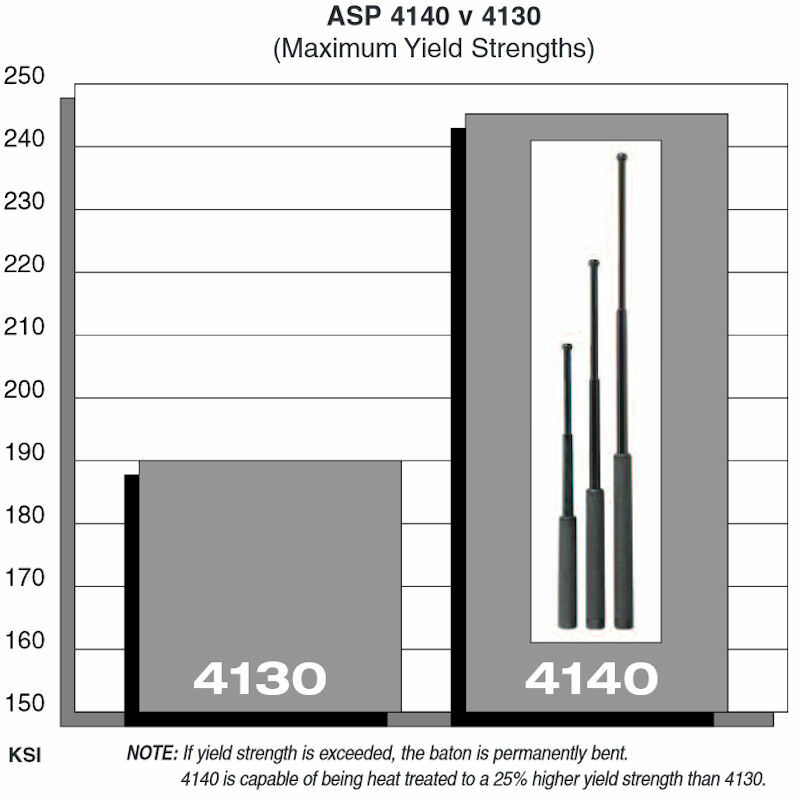 -Is 25% stronger than the more common 4130 tubing. 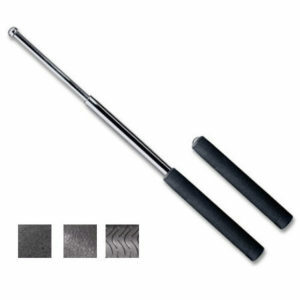 The Black Chrome coating on this baton is a state of the art black finish for steel surfaces. It is a a true black plating and not just a paint. The final result is an extremely hard surface that will not scratch or rust. It is exceptionally durable and does not flake or peel. The Black Chrome Finish is smooth to the touch while being deep and rich in appearance. Foam Grip for a more comfortable, cushioned hold. This grip is replaceable with our replacement grip kit. 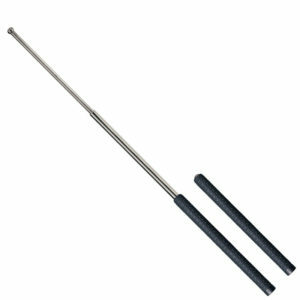 Duratec Grip-These Grips are injection molded directly onto the handle of the baton. The comfortable cushioned grip is easily retained in the hand and has the feel of a custom knife or handgun grip. Internal rings lock the handle into position to prevent shifting. The DuraTec has a clean, smooth appearance, improved grip durability, rubberized gun grip feel, and a soft textured surface. 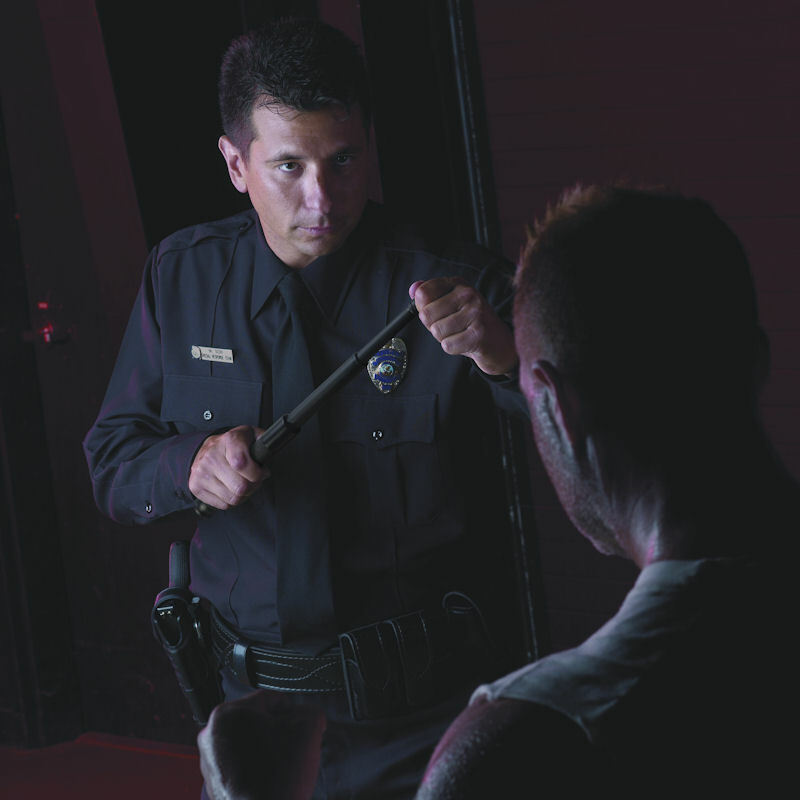 Wavemaster Grip for increased retention in hot, wet and humid environments.The geometric arcs on the Wavemaster Grip provide raised ribs that secure the grip of the baton to the users hand. The geometrically opposed wave pattern ensures both linear and lateral retention during the most intense encounters. The Wavemaster Grip has a soft feel and is tear resistant. The internal positioning rings make sure the grip does not become dislodged. I’m extremely pleased with my ASP 21 inch Black Chrome Wavemaster Grip Baton. 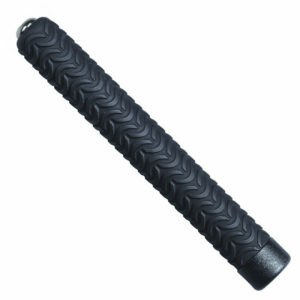 So much so, that I also ordered a ASP 21 inch Electroless Wavemaster Grip Baton. Both appear to be superior to another brand baton that I’ve used previously. Time and usage will ultimately confirm value for the cost. Ordering to delivery was less than 7days….outstanding..!! The batons were received as advertised and they’re great. My expectations were high since I know the ASP brand and those expectations were met. Shipping was fast and I would buy from you again. I purchased an ASP Black Chrome Baton and am extremely pleased with the purchase. The quality is top notch. I put this thing to the test and really tried to break it, but hardly put a scratch on it while smashing some bricks with it. Received my baton withing 2 days of the time I placed the order. Am very happy with the purchase. I is a little heavier and larger than I anticipated, but a friend in law enforcement said this was the one to get. 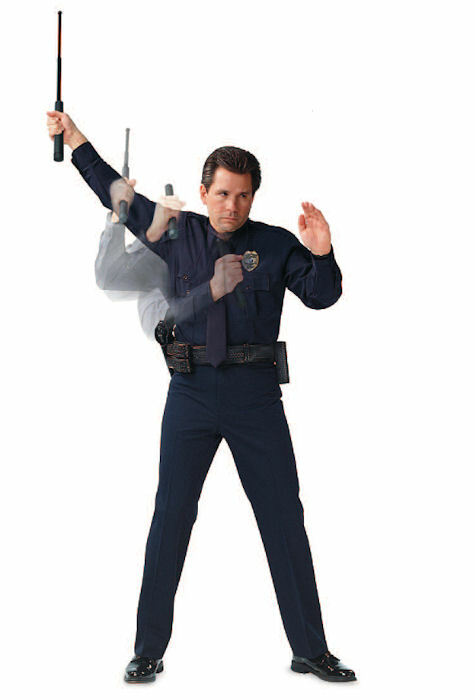 Is there a holster for my baton that is easy to use and would not be too bulky? I bought the 16 inch black chrome baton and love it. It suits my needs perfectly. I will also be buying the 21 inch and possibly the 26 inch at a later date. Used the ASP baton in 26 inches before and it is a great tool! Solid if fully deployed! Easy to service and adjust release tension!! Perfect as with all ASP products, the usps packaging was just about destroyed though. The 21″ baton lives up to the hype. The construction is outstanding and durable for the shaft and handle. The Duratec Grip provides outstanding grip retention. The only weak-link is the retention clip which broke after the first week; easy enough to replace just ensure you have spares on hand for the baton you train with. I would purchase this again and recommend this product to all. once the baton is at full extension hard to retract even when pounding on a concrete surface (only surface that seems to work). it is as if it needs some sort of fine dust type lubricant to unlock it like graphite. i have to strike it very hard several times on the concrete and it take the black paint off the end to retract. it does extend well consistently as advertised. that is why it only rates a 4 star rating. My order was just what I expected. The order came in on time and I was pleased doing business with this company. Very satisfied with my purchase. Have a close relative who is a police officer and this is what the department uses. I’m very happy with the baton I ordered. I got a 26″ black chrome ASP Baton. 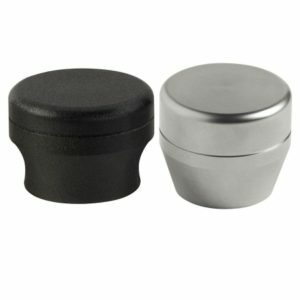 It functions perfect and even came with a free breakaway end w/cap. Lol – some of the reviews are awesome. You cannot go wrong with the ASP baton, very solid piece of ‘backup’. Batondefense/miles tactical was very prompt with the delivery and even providing an email update on the order status. There was a problem with the delivery (item was damaged during shipping). Customer service followed up and corrected the issue immediately. Nice job, I appreciate it!! 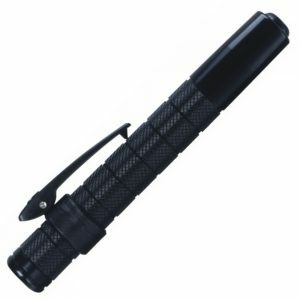 This baton is easy to grip, is sturdy and is surprisingly heavy for its compact size. All ASP products are the best there is. The baton will always be the back up to go to in a critical situation. Enough said. The review of Baton Defense/Miles Tactical is given a 5 star experience rating. This is my first purchase from them, and every aspect of the purchase and delivery were exceptional. Item arrived safely ,excellent service -thank you . This item I have been using for years already as it is issued to me for work . I purchased a spare to use in training as I have to be re-certified in its use every three years . Im so used to the white man beating me when I do stupid s**t I decided to get one so I can do the hard work for them. Lemme tell ya, I ain’t so smart but dis be da bes investment I done eva made. Love this thing. I love violence, and I’m afraid of everything, so the more guns and weapons I can hoard, the better. Us frightened, conspiracy theory, cowardly white guys gotta be armed to the teeth,…right? Not only can I tell a big difference between the quality of the ASP product versus other batons (which is fantastic with the ASP brand), but the customer service given by Miles Tactical was wonderful. Immediate responses and a personal touch. Love the product and will happily buy from you again! Great product! I immediately used it on my neighbor, who already had fragile knees. Needless to say, my hedge trimmers were returned immediately!! Definitely a powerful can of whoop ASP! You can tell this product is made with high quality steel, just lock it out and tap it on the floor and it will create a distinct harmonic noise, that is how you know that this is made out of some very high strength steel! As a martial artist I will use the baton for self defence only. Arrived on the next business day after the Labor day weekend. Awesome. Awesome product, w/ the best price I’ve ever seen online. Got it in 2 days! I’ am very pleased w/ the service and the quality of my Baton. Thank you!!! No matter who you are law enforcement, militant, or just layman, if you want a retractable baton and any products to go with it; look no further. This baton is amazing. You can just tell that a great amount of love went into each and everyone of these babies. Thank You for the fast deliver of the product. I walk my dog Tess and the Baton is a small but mighty defense if ever I need it. Solid construction. Exactly as expected. Ideal for physical training. Service is also perfect. Great service, fast delivery. The baton is spectacular, the only problem is getting the baton back to its initial position, only beating hard against the floor. NOTE; The tip must be brought straight down on a hard surface such as pavement. This baton is superior in every category. The grip is superb and the expanding pieces lock in place to give you a strong base to work with. It is a pleasure carrying this baton with me. This is a quality product. 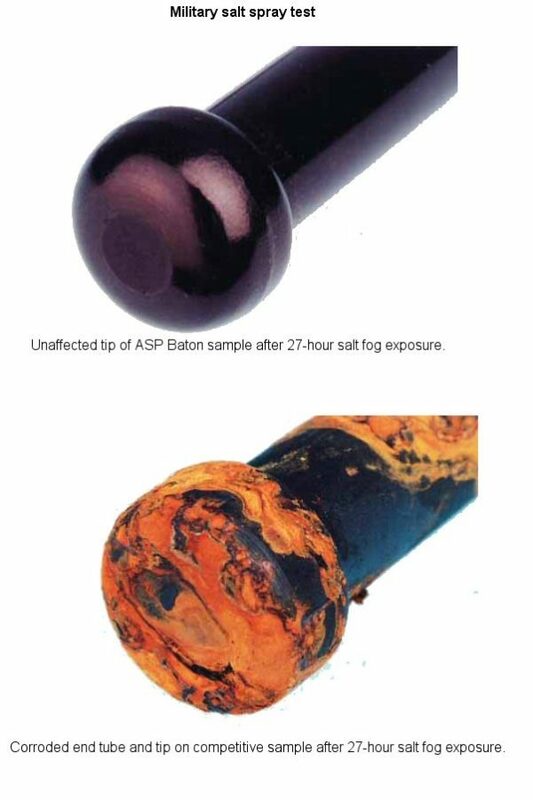 I have been in Law Enforcement for 25 years and have used ASP products before. This baton is a pleasure to carry and very dependable. This product presents consistantly every time. Very happy with the 16″ baton. It’s sturdy, well-made with an excellent grip, and folds small enough to carry anywhere. Thanks! like the title says, i just hope i never have to use the baton. bought 2 for my businesses.they are retail and i want to have some protection without getting a gun. thank you. Very satisfied. Item arrived on time and was as expects. Couldn’t ask for more. Thanks! They were quick and very precise. Loved the service, will buy from them in the future if needed. This is a Great product. Received excellent service. Impressive weapon, easily concealed and very well made, I expect it will last indefinately. 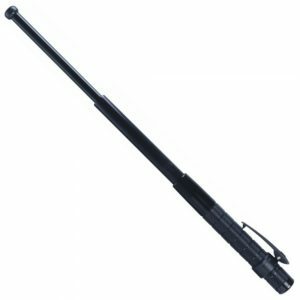 I purchased the 26 inch federal baton with a leverage cap. First, this weapon feels solid and well manufactured. This is definately a big step up from any cheap knock-off batons. Only a fool would trust his life to a piece of stainless steel crap knock-off baton from Hong Kong. ONLY BUY ASP. EVERYTHING ELSE IS GARBAGE. This baton is just slightly too long with the lev cap attached to conseal easily. If you want effective range and good consealment size, get the 21-inch with the Lev cap or the 26-inch without the Lev cap. If consealing it is not a priority. 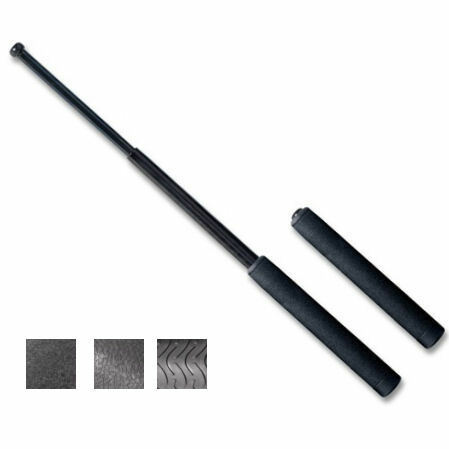 I suggest getting this baton; the 26-inch with leverage cap. The leverage cap is double-functioning. Even a closed baton with a leverage cap is an extremely effective weapon. Of course, the cap also adds a tremendous amount of power to the swing of the expanded baton. My final verdict? 21-inch with lev cap for conseal and carry. 26-inch with leverage cap for service use. Everything else aside, this is an excellent weapon. I’m sure that a well trained warrior could easily beat his way from one end of a rioting crowd to another. This is also both a lethal and a non-lethal weapon depending on your use and training. Sometimes extreme actions are necessary to stop extreme people. This baton will do the job, period. Great baton. This thing is built like a tank and I am just trying to hurt it. It is perfect. This is the best baton out of all the manufacturers.